Ronald Reagan Presidential Library/NARA President Reagan waves to the crowd outside the Washington Hilton moments before being shot. On March 30, 1981, President Ronald Reagan was shot in the chest by John Hinckley Jr., a college dropout hoping to impress actress Jodie Foster. Hinckley shot three others during the assassination attempt, including Press Secretary James Brady, who was left permanently paralyzed. Ronald Reagan had been in office for just 70 days when he traveled to the Washington Hilton to speak to union representatives. 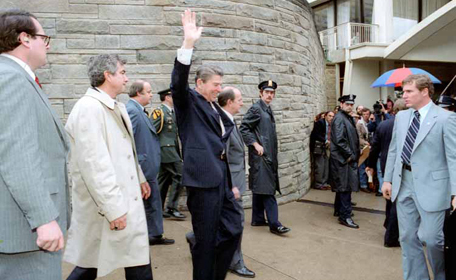 After the speech, as Reagan walked out of the Hilton to his limousine, John Hinckley Jr. stepped forward from a crowd and fired six shots with a .22-caliber gun. The first shot hit Press Secretary James Brady in the head. Ensuing shots hit police officer Thomas Delahanty and a Secret Service Agent Timothy McCarthy. The sixth shot ricocheted off the limousine and struck Reagan in the chest, missing his heart by just an inch. Reagan was shoved into the limousine by Secret Service Agent Jerry Parr and taken to George Washington University Hospital. Reagan recounted in his autobiography, “An American Life,” that he did not know he had been shot; he believed that he had broken a rib when Parr tackled him during the shooting. Reagan managed to walk out of the limo and into the hospital before collapsing. While Reagan recovered from his injuries at Camp David, he called in to the White House Correspondent’s dinner on April 25 to deliver his remarks. Just months later he addressed Congress to promote his economic plan and received a rapturous ovation. The public image of Reagan became stronger than ever; concerns about the 70-year-old’s vitality faded and he earned “his reputation for toughness, humility, and strength,” writes the Miller Center for Public Affairs. The assassination attempt was captured on video. As the president underwent surgery, Secretary of State Alexander Haig appeared to believe that, with the president in the hospital and Vice President George Bush temporarily out of touch, he assumed the powers of the president. In fact, under the 25th Amendment, Haig was fourth in the chain of succession behind Bush, Speaker of the House Tip O’Neill and President Pro Tempore Strom Thurmond. The confusion among Cabinet members over who was in charge is illustrated in tapes released in 2001 by National Security Adviser Richard Allen. After the meeting, Haig went before a press conference and declared that he was “in control.” He was widely ridiculed for the statement, which contributed to a career decline. John Hinckley Jr. was a depressed and mentally unstable loner who got the idea to assassinate the president from the movie “Taxi Driver,” which he watched 15 times in the years leading up to his assassination attempt. In the movie, protagonist Travis Bickle (Robert De Niro) plots to gain the attention of a political campaign worker (Cybil Sheppard) by trying to kill a candidate she works for. His assassination attempt fails, but he becomes a hero and earns Sheppard’s respect when he kills the pimp of a 12-year-old prostitute played by Jodie Foster. He also began hanging around Yale University, where Foster was a student. After failing to gain her attention through letters and phone calls, he decided to needed to carry out a noteworthy act to win her affection. Hinckley would be found not guilty by insanity on 13 criminal counts. The verdict sparked a national uproar and led to legislation making it more difficult to be acquitted on the insanity defense. Hinckley was placed in a mental hospital. After three decades of treatment and gradually being allowed greater and greater freedom, Hinckley was released from the hospital in 2016 and allowed to live with his mother in Williamsburg, Virginia. Although the president recovered from the shooting, his press secretary, James Brady, was shot in the head and barely survived. He was permanently paralyzed on his left side. Brady and his wife Sarah devoted themselves to campaigning for stricter gun control laws; after 10 years of work, they were able to get President Bill Clinton to pass the Brady Bill in 1993. The law requires a five-day waiting period and a background check before the purchase of a gun. James Brady died in August 2014 at the age of 73. His death was ruled a homicide, due to the injuries he sustained in the shooting. Sarah Brady died in 2015. The advocacy the started continues today at the Brady Campaign to Prevent Gun Violence. Read findingDulcinea’s profile of Ronald Reagan. In 2012, we published this article about this historic event on the New York Times Learning Network. This article connected the event to current issues and offered reflection questions to help the reader think about its relevance today.